Founded more than 220 years ago, Sydney is the most populous city in Australia and one of the largest cities in the southern hemisphere. The city is located in the area called The Rocks which is the oldest colonized part of Australia. Nowadays, the city is continually developing, being one of the world’s top financial centers, with a diverse economy and extremely high living standards. The mixture of old and new, as well as its fabulous beaches makes it the top tourist destination for foreign travelers coming to Australia. What can you visit in Sydney? 1. The central business district, also known as the old town center is full with historic buildings as well as modern day skyscrapers. There are wonderful attractions and landmarks such as the Circular Quay, Chinatown, the Rocks and the relaxing Hyde Park, where you can enjoy a quiet picnic. Shopping enthusiast will absolutely love Pitt Street Mall which features a huge selection of high end shops. 2. The Sydney Opera house is most likely the most famous building in Australia and it is located near the bay. The opera was designed and built in the early 1950′s and it was inspired by orange segments, Maya temples and palm fronds. Every tourist coming to Sydney must visit this wonderful piece of architecture. Also, the Opera has an excellent sound quality and it features six auditoriums with various shows, ranging from theater, ballet or opera. One hour visitor tours are organized daily and sell for a low price. More in depth two hour tours are available at a special price. 3. Have fun at the Luna Park. 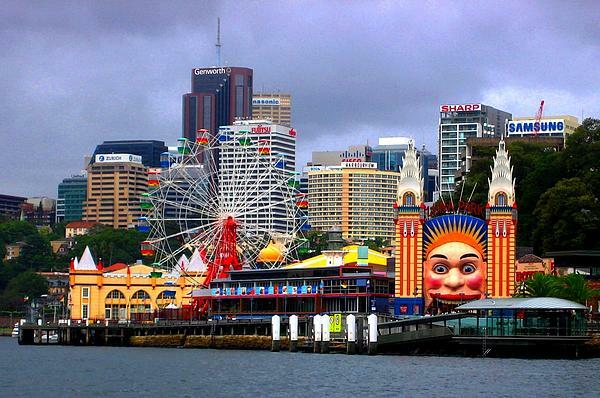 Situated in the North Sydney area, Luna Park is one of the largest amusement parks in Australia and is a perfect choice for families. The park features numerous green areas, attractions and activities that will make you want to come back for more. 4. Hit the local beaches. Australia is known worldwide for its beaches and Sydney has one of the best. Bondi beach is absolutely spectacular and is a top spot for surfers as well as swimmers. The clean white sand and the clear blue water will leave you breathless. Where to stay and eat in Sydney? Sydney accommodation is for any tourist, whatever his preferences, possibilities or interests. Of course, depending on your budget, there are numerous options. Most tourists however, prefer to choose a hotel located in the central business district as it is close to any attraction. The CBD area also boasts one of the best restaurants featuring almost any cuisine worldwide. You can enjoy European, Chinese, Thai and American cuisine at reasonable prices and in a great setting. Restaurants also range in prices from the most affordable small homely places to high end luxurious places located on the top floors of skyscrapers. The pub scene and night life is also extremely active and exciting and you will never go home bored. Clubs and dance halls are open every night almost until dawn which makes Sydney the best place for night time adventure seekers.